Remove roast from the refrigerator and loosely cover at least 3 hours before cooking to allow it to come to near room temperature. This is important so that it will roast properly. Preheat your oven to the highest temperature it will go, preferably 500°F. 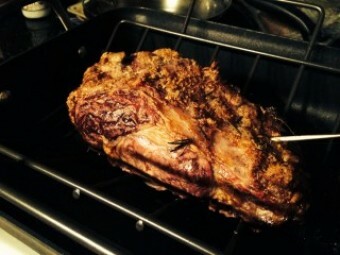 Generously rub the entire roast with either sea salt or kosher salt. Insert probe style thermometer into the thickest part of the roast and place the roast fat side up in a roasting pan in a rack. If you do not have a rack, that is ok, just place in a roasting pan. Remove roast from oven when desired temperature has been reached. Let rest for 20 minutes covered with aluminum foil before carving. The roast will continue to cook while resting.